The Ebola outbreak is now "stable" in Guinea, where the latest crisis began, the World Health Organization says. There were still some flare ups in the south-east, but things were improving in other prefectures, WHO co-ordinator Dr Guenael Rodier told the BBC. 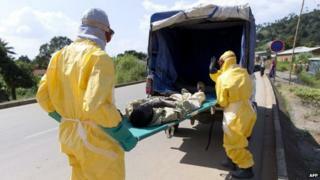 More than 5,400 people have died in the latest outbreak, with Guinea, Sierra Leone and Liberia the worst hit. The outbreak can be ended by mid-2015 if the world speeds up its response, UN Secretary General Ban Ki-moon has said. But he warned that although the rate of new cases was slowing in parts of West Africa, Mali - where six people have died and a seventh case has been reported - was now of deep concern. Media captionDr Rodier: "Lessons have been learned"
There have been more than 15,300 reported cases of Ebola since the outbreak began earlier this year, the WHO says. More than 1,200 people have died of Ebola in Guinea alone. However, Dr Rodier said that the situation in Guinea was now "relatively stable". "When you look in more detail, you see that it's still quite active in the Guinea forest area [in] the south of the country," Dr Rodier said. However, he added that the situation was "actually improving in a number of prefectures, especially Conakry", where there was a fairly good understanding of how the disease was spreading. The WHO has faced criticism that it was too slow to respond during the start of the crisis. However, Dr Rodier said it was the first time there had been such a serious outbreak in West Africa, adding: "Lessons have been learned." Guinea has not been as badly hit by Ebola as neighbouring Sierra Leone and Liberia. Eight months since the outbreak was first declared, some still do not believe Ebola is a real disease, and health teams trying to trace new potential cases are still being refused entry to some villages, says the BBC's Tulip Mazumdar in the capital Conakry. Meanwhile, a group of 30 health workers from the UK's National Health Service have flown to Sierra Leone to help treat Ebola patients. They are also expected to train local staff at treatment centres across the country. Video "Lessons have been learned"